The Iowa House has voted to create a new commission to study changes in the state’s bottle deposit law. It’s a go-slow approach at odds with Governor Culver’s call for adding water bottles and other noncarbonated drink containers to the state’s nickel deposit process. Representative Donovan Olson, a Democrat from Boone, says the task force will be asked to come up with a report by January 1st of 2009. “The intent of this is to look in a comprehensive manner at all of our recycling initiatives to that next year…we can come up with solutions to many of the litter and pollution problems that we have around the state,” he says. The group will be charged with reviewing the state’s 34-year-old “bottle bill” which places a nickel deposit on many beverage containers. 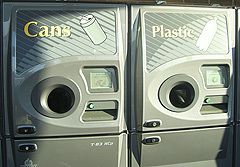 Iowans return most of the empties to a retailer to redeem their deposits. Representative Steven Olson, a Republican from DeWitt, says voting this year to expand the “bottle bill” to include water bottles without fully investigating the consequences is unwise. “I think it’s a very good alternative…It gives some time to come up with some alternatives and what we would do with all the (refuse) that would be created,” he says. The new task force studying the issue would have 28 members, including representatives from environmental groups, redemption centers, the League of Women Voters and landfill operators who’ve been pushing for the bottle bill expansion as well as grocers and beverage distributors who’ve balked at the idea. The Iowa Senate must endorse creation of the task force, too, before the group would begin its work.